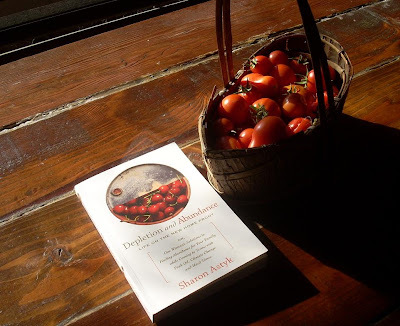 Depletion and Abundance by Sharon Astyk. Buy and read, please. Thank you. While crossing the country (at 55 mph, so I had plenty of time for looking, and never passed anyone), I saw many things, of course; Lookout Mountain, the Tennessee River, Nashville, the Ohio by moonlight, a deeply sleeping St. Louis, sunrise over the Wasatch, the blinking lights of rows of radio towers in the inky night of Idaho. 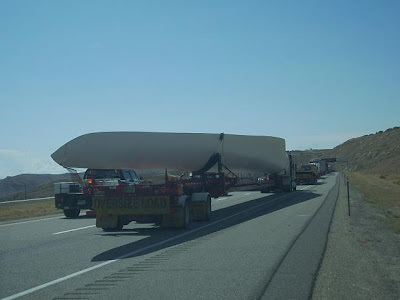 But mostly I saw, on truck after truck after truck, new wind power gear in transit to windy places: in Tennessee, Missouri, Nebraska, Wyoming, Utah, and Oregon, by the dozen. Towers, generator housing, rotors. Lots and lots of rotors. If the economy tanks before these are all in place, we will be sorry. There will be no drilling our way out of this, and precious little enough wind installed to make up for it much. It's nice to see people trying, though. My instinct is that with so many trucks moving these things around, they have to be more cost effective than some people say. What did I learn this year (as reported to The Growing Challenge)? 1. we rediscovered home grown spuds. The Yukons are fabulous. 2. We don’t know that the runner beans had anything to do with it, but we put them in the same beds with the snap peas, only a few weeks later, and let them climb the peas … anyway, we had peas all the way into September from all three spring plantings! A record. 3. Spinach and beets did fabulously in the shade of the peas and beans. 4. We winter gardened last year, right out in the ground without row covers, and did OK even though it was really cold, so we’re expanding that effort this year. 5. Large tomatoes did poorly but salad sizes did well. 6. Not such a great squash year here, either; yet the bell peppers and eggplant are doing great!! 7. Beds were dug once by hand and then given a permanent mulch, and that went OK; we’re looking at no-dig for next year, or only with a broadfork. 8. Corn grew very slowly, and our having selected older varieties like Country Gentleman seemed to compound the problem. We’re eating corn, but it didn’t come in until last week. Next time someone says la niña, we’re listening. 9. When you’re tired, tired, tired of making applesauce, go to apple butter. And what did we do this week? Plant something: We put in more bok choi, kale, red cabbage, beets, radishes. Harvest Something: !! -- tomatoes, apples, lettuce, beets, celery, zukes, corn, apples, cukes, radishes, potatoes, apples, blackberries, pears, bok choi, apples, cabbage, basil, peas (!!) beans, dry runner beans, apples, trout, pikeminnows, eggs, pears,onions, apples. And LOTSA eggplant. Preserve Something: frozen blackberries, apples, zukes, applesauce. Dried tomatoes, basil. Solar, on the dashboard of the Saturn wagon in 85 degree late September weather -- weird. Store Something: apples, roofing supplies, cardboard, am now starting to gather up pallets and such with the new pickup, watching Craig's List for opportunities. Manage Reserves: acquired 1999 Ford Ranger pickup from my mom and dad. Cooked Something New: It's been so long since I made applesauce that it was like new. Used Rombauer & Becker's very simple directions. Worked on Local Food Systems: Much of the above, and selling eggs,and giving away veggies at work, while explaining how we grow them, complete with handouts. Reduced Waste: pulling other people's cardboard and waste wood from the waste stream. Learned a Skill: how to sleep at rest areas (don't ask). I have been shelving, in the library where I work, because my student workers are not back for fall term yet, and it's ironic to me, the titles I'm putting away at the moment -- weighty tomes, authored on Wall Street, concerning the world's financial statistics. Volumes for 2004, 2005, 2006 -- my job is to get them into the right order, so that those who need them can find them. But I'm feeling mildly panicked about that. Who's gonna need this stuff? It's mumbo jumbo from a kind of a religion, one that has just imploded. What I think -- and I've said this before, here -- is that you cannot run a country or a world any differently than you run a household. The charging of interest on money lent to others is not based on any kind of real-world productivity. Whether you are paying interest on principal or receiving interest on principal, you're participating in a flight of fancy -- and from time to time, reality bites that fancy in its fancy keister. We're in one of those times. Suppose the world were made entirely out of oil, coal and methane (I'm not the first to use this notion, but let's keep going here). To see by at night. To grow and ship food. To make and move practically everything. We will still, even though the planet is made entirely out of the stuff, eventually use up half of it and see demand exceed supply. And by then, have nothing much to breathe worth breathing. So, some of us say we're at about that point now (which I find relatively easy to believe) and some scoff at it. But, remember, we're on a platform made mostly of rock, not coal, methane, and oil. So what's to scoff? We're only some 7,000 miles in diameter. And note that the scoffers tend to be the same crowd who cast aspersions on evolution and before that were casting aspersions on the roundness of the earth, and are now bringing us the spectacular failures of Wall Street. This crowd's attitude toward the planet's carbon resources seems to me to very much resemble its attitude toward economic resources. The resources are treated as infinite; and they are no such thing. You cannot treat equity as an inexhaustible resource, just as you cannot treat buried hydrocarbons as an inexhaustible resource. Bubble, bubble, toil and trouble. Not that I'm about scarcity; I believe in abundance, but what I see as abundant is mostly sunshine and human ingenuity. That's maybe another post. So, back to the well-managed household for a moment. The householder sees resources (in the form of food, fuel, construction materials and the like, or the equivalent in the form of a shorthand mode of exchange called currency or money) flowing in two directions: out and in, against a general background of the second law of thermodynamics, that is, you cannot get something for nothing, and even your something will diminish over time all by itself. So, to prosper, a household must see its income exceed its outgo, even just to stay even. So you may accumulate resources by means of income, from hunting and gathering through agriculture to industry, and you must, to break even, accumulate at a rate that can handle consumption and maintenance. To prosper, your income must exceed consumption and maintenance both, and it is axiomatic that participating in a bubble may be about something but it is not about income. A householder bent upon buying a McMansion, filling it with plasma TVs and driving to and from it in a Yukon to buy "food" raised mostly in CAFOs is not doing good stewardship. No nation has been cruising so single-mindedly toward a collision with this truth than the United States, but it is becoming a worldwide trend, just in time perhaps, for everyone's idea of an apocalypse. So now, let's think of the household account as a checkbook. This is a real-world checkbook, but it works just like a monetary one. You may make deposits: a sack of potatoes, gasoline, roll roofing, a sweater. You may write checks: eating potatoes, driving to see Grandma, roofing the house (and subjecting the roofing to wear and eventual loss through rain and shine), wearing out the sweater or perhaps losing it on a bus. If you spend more in checks than you can deposit your checks will bounce. But oil company executives and Wall Street and the current administration of the United States (and perhaps many other countries) do not seem to know this. Nor do most media, especially Talk Radio. We might blame it on the current U.S. administration and its financial, military and industrial sycophants, but in a nation, or in a world, dominated by greed, the greediest are only relatively more blameworthy than the rest of us if we have been living upon their promises rather than the simple promises of the earth, the air the water, and the green things, without which we are nothing, and upon the well-being of which rests our all. It's not as if we had not been warned. So: what to do now, with the Great(er) Depression near upon us? I suppose there will be resource wars as some attempt to balance their checkbooks by reaching for those of others. Perhaps some, I among them, will not die a peaceful death. It's not like that hasn't been a pretty common response to similar situations. If the violent come, defend yourself if you can, and if you cannot, reflect that no one will live forever on this green earth, the violent included. In the mean time, those of us with any remaining shred of rationality might consider modeling good stewardship. That the world may go mad and abandon civilized behavior does not require of us that we do the same; and the best hope lies in the modeling of good stewardship. Do what is right so that others, seeing this, may do the same. Observe your self-interest and your family's interest and your neighbor's interest by not living upon interest; live by the work of your hands and make, and do, good things. First, consider the automobile. What's the mileage? Carry more gas (petrol to some of us) at a time, to prevent evaporation loss, get regular tune-ups, check the tire inflation. Trade down in size to better mileage: there are vehicles that do fifty miles per gallon, and this is more significant to your kids' future than the prestige that big one gets you. Get more passengers, and carpool. Be a passenger. Leave the car home and ride the bus, the train, the subway, the ferry, the monorail, the light rail, the taxi, or the bicycle. Walk. No light rail? No bike lanes? No sidewalk, no trail? Write and call the local planners and city administrators; lobby relentlessly. Push hybrid; push electric. Sell the $*#!!! thing. Or give it to the GoodWill or St. Vincents. While you're at it, sell the motor home, the motorboat, the plane, the skimobile, the jet ski, the go cart, and the dirt bike. You don't need them; if you do find you need one once in a while, don't buy, rent. Telecommute. Lobby for a shorter work week, then spend the long weekends, the holidays, and the vacations at home (working in the garden!). Second, consider the home. Why have a big one when a well-planned small one will do? Insulate, turn the heat down a bit, put on a sweater and a lap blanket, get rid of the air conditioner and plant shade trees on the south side and a windbreak on the north side. Make things out of rocks or used bricks instead of concrete. Use hand tools. No time? Turn off the television, you'll have more time. Look for low-wattage entertainment. Try romance. Romance can be cheap; instead of diamonds and skyview restaurant dinners, try being a good listener. Lean an acoustic instrument. Sing. Read. For lighting, go with sunlight through a skylight, or low-wattage fluorescent. Paint the walls white; you won't need as many watts. Replace the hot water heater, refrigerator and the freezer if they predate the energy-saving models. Install a ground cloth in the crawl space. Sort, reuse, sew, mend, repair, recycle, compost. For the furnishings, when possible make your own or buy locally made. Tear up the lawn and put in cover crops, fruit and nut trees, and fruiting perennials, on a schedule that will prevent your having to buy a new gasoline lawnmower when the present one gives out. Third, consider the food. Cigarettes? I won't even tell you, you know better. Drink less alcohol and more water (from the well or the tap). Eat less meat and more fiber. Eat less prepared food and more fresh produce. Cook less, check out raw. Use double boilers and steamers and avoid frying. Don't send out for pizza; pizza sends for you, and what it wants from your arteries you should want to keep. Audrey Hepburn said the most effective diet is to share your food with the poor. Clean out the cabinets and put the stuff in the food drive bin. Find out who's offering organic produce in your area. Find out if what they're offering is really organic. Find out what "organic" is first, if you don't know, and don't depend on the television to tell you. Patronize local organic cooperatives, merchants and farmers. Raise your own food. Avoid those patented hybrid seeds from large corporations; patronize farmers, merchants and cooperatives providing heirloom varieties. Use hand tools. Garden organically. Plant vegetables and fruit and nut trees. Even, if need be, in a windowbox or containers on the balcony. Preserve your own produce. No time? We already talked about that. Fourth, look at your clothes. Buy less frequently, go for longer lasting, and think cotton and wool and natural dyes. Most clothing now comes directly from the planetary checking account, and "polyester" should become an embarrassing word in your wardrobe. When possible, make your own or buy locally made. Fifth, think about your work. Are you working to get your kids out of planetary debt or deeper into it? What are your living expenses? If you're a couple, consider cutting those expenses until only one of you has to work or both of you can work half time. Give the earned time to increased quality of life for the children, or, if you've wisely refrained from contributing to the disastrous population curve, to your friends and neighbors. If you're in the mining, manufacture, distribution, transportation, sales, advertising, or application of depletionary items, from autos to herbicides, re-career as soon as you feasibly can. Think small. We're not talking communism here, just common accountability -- ok, communalism; there's a big difference and we need not go into hysterics. It's all tribes. Even when it's Wall Steet, it's a tribe. Deal. Sixth, and I'll stop here for now, what about that vote? If you don't have the vote, be careful who might be reading this over your shoulder, and start working on what it will take to get the vote. For this, your life will not be too cheap a sacrifice for your childrens' future. If you have the vote, think about what you're allowed to vote on. Is it just big political party versus big political party? Or nuclear versus solar? Roads versus light rail? Agribusiness versus sustainable farming? Clear cuts versus forest maintenance? Or to put it more simply, corporate greed versus life? If your vote can't access reality, if it isn't patching the holes in the planetary checking account, change that. Campaign finance reform will be the least of your worries. Get the vote, keep the vote, use the vote; get the real issues up for a vote; inform the electorate. And do what it takes to make sure your vote is counted. Perhaps you won't see results on this in your lifetime. But consider the alternative. Whew! OK, I know, I haven't done maybe a hundredth of that stuff. But I chip away at it here and there. I'm aware, particularly and painfully, of the cost of the infrastructure that maintains the glorified suburb that in my neighborhood passes for country. It takes six times as much of the planetary checking account to establish a rural home as it does for a comparable urban row house. I've elected to be a creature of privilege, and I don't care to look too deeply into what the mirror says about that. But in some things I can give back something of what I have taken. One way is to learn from the past, to gain pre-fossil-fuels skills, and to apply them, redesigning this acre of the landscape to produce food, shade, and windbreak in ways that do more good and less harm than was done here previously, and to share the knowledge gained, as best I can, with others who also care to learn. Hier stehe ich; ich kann nicht anders. Well, tomorrow gets to be officially Fall, I suppose -- I've been away on a journey, and am ready to go up and tar some seams on the roof, and here comes the rain. So I'm doing applesauce and spelt bread, with some apple and tomato and rye and oats and buckwheat and chives and a leaf of shredded Bok Choi thrown in -- which should make me happy, as I've had to be away from it too long -- and it's turning out well -- but I'm fighting depression and I have an almighty limp. The limp can't be helped -- part of the cartilage below my left kneecap seems to have separated a bit when I caught my 245 pound offspring, as he fell off the roof -- like any mom -- like my own mom, who had to do it several times -- I would have caught him had I known it would kill me, let alone pop a kneecap -- but it does put a crimp in my remaining roofing work. The depression thing is a bit more complex. My mom and dad can no longer legally drive. He's 91, has, among many other things, including a recent diagnosis of Alzheimer's, serious glaucoma. My mom's 80, has had all kinds of heart issues, leading up to a major stroke followed by an aneurysm in one eye. A friend takes her shopping, and my dad helps her with stuff around the house -- when his blood pressure is high enough to let him crawl out of bed. We all saw this coming, and I, their only child, tried, back in 1999, to do the obvious thing -- bring them here while they could still move. They picked out a place, put their stuff in a moving van, sold their place on the canal in Florida, and I drove my dad across the country in their car and my mom flew out as soon as the van was unloaded. They gave it two years. But they've been Southerners for, like, forever -- and could not forgive their strange new neighborhood for being a bedroom community in which no one bothered to get to know them. Our house was five miles away, and they couldn't spend all their time here, nor could we spend ours there -- school, work, work and school intervened. I was able to mow their grass and paint the house and pop in every couple of days for an hour or so, most weeks, and that was about all. Plus, and this is so true of so many families -- we were incompatible. So they moved back to Florida. It was a tougher trip than the first one, because the twin towers in New York had just fallen, planes were gingerly testing the waters under much stricter travel rules, my dad had no intention of flying and so she went by air and he went by train, under really tough conditions -- the train had to stop and be searched for terrorists every few hundred miles, seemed like -- while I packed their stuff into the moving van, and saw it off, and then tried to sell the house, which took two years. I had, in days gone by, called them once a month or so, so I stepped it up to once a week. Visited when I could, which was seldom. And then, one day, my life began to change in ways they could not really fathom. I was clearly not outlasting them, and had something I needed to do, which might estrange us entirely. I was fifty-four, and it was past time for me to begin my own life, which would involve taking on a hormone regimen, getting a new name, and surgery. But on with the current story. As I said, they can no longer legally drive, and they called me up and asked if I'd like to visit, on their dime, and talk a bit,-- and to sweeten the deal, asked which vehicle I wanted. The choices were: a bulging new SUV that I had begged them not to get, with 2,000 miles on it and wretched gas mileage, and a 1999 Ford Ranger pickup with 50,000 miles on it, and so-so mileage. So Beloved and I went into a huddle and concluded that, global warming and peak oil notwithstanding, having three paid-up vehicles on hand meant not having to buy one for a long, long time (if no one broadsides us in any one of them), and a chance to allocate more resources to the homesteading program. It would even help us stay on the accelerated retirement schedule. Also, lots of free stuff that we really need has been passing us by on Craig's List, and a pickup could change all that. We added a third week to my vacation, with my bosses' blessing, and I would spend the first two hobbling around on the roof, then the third hobbling around the United States. So we opted for the Ranger. Now to get it here. I flew red-eye from Eugene to Daytona Beach via Portland, Phoenix,and Atlanta, running in the wee hours from terminal to terminal. Rough way to travel but it only cost my folks about $340, one way. I spent three days with my mom and dad, and gained a lot of weight on their enticing and deadly Southern Fried cookery. We talked about their plans (hardly any) and options with which I could help (even less). I fixed the DVD player and showed them 3,000 family photos on my laptop. They have a very short attention span nowadays, but the photos enthralled them and they took turns doing chores and watching the slide show, cup after cup of their watery instant coffee in hand. End-of-life issues don't panic any of us; we're all realists. While watching the slide show, we could discuss things like living wills, no viewing, no funeral, donating them -- our -- selves to medical schools, and the like quite easily. No, they don't plan to move to a home soon. No, no housekeeper messing with their bedrooms, thank you! The idea seems to be to die in harness. And they've done all they can to simplify things concerning their remaining stuff and the house and bank account. None of this was depressing to go into and explore together. These things were not problematical for us. But I am who I am now, and not who they knew for sixtysome years, and they can't catch up. My dad is upfront about this. He took me out to the shed, and showed me a few things he had done for the truck, and some tools and doodads we might want. As we moved through the intense Central Florida heat, I limping, and he shuffling with his two walking sticks, he said, "I have Alzheimer's, y'know, and so my head is stuck -- I can't get it about what you've done with your poor body, and I hope you will have patience with me." I couldn't fault that. He'd stopped talking to me for a year, post-transition, and here he was being my dad again, and asking for forgiveness in his way -- which in itself was a remarkable thing. I don't remember him ever asking for forgiveness for anything, in all those years. Not his style; it would be unmanly. So it was a banner moment, there by the toolshed. 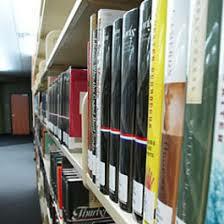 Even so, there was something in the plaintive tone of voice in which he said "your body" that held a clue for me. His mental picture of the body that was mine was that of the one that had been entrusted to them. That body of his remembrance, the health and well-being of which the work of his years, had for him a completeness that it no longer has. So it's, for him, not a change, but a loss. I have become a lesser creature. My mom's behavior is more complex, but engages the same valuation. She was actually rather excited, at first, about having a daughter, and had fought with my dad over me, then flew out to Oregon to meet me and take me shopping. She had some trouble with pronouns but you could see she was working at it. She blamed the difficulty on her stroke: "I have squiggles in my brain, heh heh." But now she can't do the name or the pronouns at all. She's affectionate and supportive and takes me to her closet to choose whatever dresses I might want. But every second sentence ends in the honorific "son." "Could you take out the trash for me, son?" "Emily, could you take the trash out for me?" "Daughter" is a designation but it is not an honorific. To say, "Could you take out the trash for me, daughter?" is just weird -- hardly anybody does it. "Son" has a cultural value in traditional families that "daughter" does not have. My transition, in and of itself, does not much trouble my parents. Their loss of status, in my having voluntarily lost mine -- as they see it -- does. They will mourn the death of their son, and also mourn the birth of their daughter, to the end of their days. And my mom is careful, despite her disclaimers, to remind me of this. Eight, maybe ten times a day. I have robbed them of the one thing that gave their lives meaning: a male child. Language is full of markers like this. Notice how husbands say, "at my place," while wives say, "at our place." Wife sees a partnership but husband sees a sole proprietorship. My mom watched closely, with her remaining vision, which is all peripheral, as these word choices struck me. At any sign of a pained expression she would assume that I was angry with her for her "mistakes," and then she would pout. And I'd have to try to find a way to smooth it over, all the while competing with the tremendous noise in the room from the ever-present patriarchal triumphalism of Fox News. But several things became clear to me all at once. One is that the usages were not mistakes. Another is that even though these were not mistakes, they were not malevolent, simply manifestations of the grief emanating from a reality I could not share. My parents are good people, they intend me no harm but only good, and they have raised me, by stunning lifelong example, to a remarkable standard of integrity, for which I'm grateful. So I was not angry, simply trying to bear up under repeated shocks that were devastating to me inwardly, and my face has never been one that could hide feelings. Another was that I was about to become ill under this assault from, not them, but certainly from the patriarchalism to which they had been raised. Whenever I was alone for a few moments, I'd start shaking and weeping. I was facing a 3100 mile drive under difficult conditions and a tight schedule, and the situation in the house was giving me insomnia. Also I was finding the endless bacon, ham, sausages and grease indigestible. This was simply an environment in which I could not thrive for more than a few days. Not enough moxie, whatever. So I proposed that I move up my departure by a day. All parties agreed this was the thing to do. In the morning, at four a.m., I climbed into the truck cab with five days' rations, turned over the engine, and backed out of the driveway, as my dad, silhouetted in the carport light, watched what had been his beloved child away into the pre-dawn fog. [posted by risa] La Niña appears to be slowing down, and we are set to have had about fifteen golden September days in a row with temps in the 80s. The Canada geese have taken an extended layover from their gatherings for the flyaway; the tomatoes are ripening at last; leaves on the oaks, ash and cottonwoods are clinging to their greenery; risa is roofing and turning nut-brown. I'm nearing the end of the project, though. All the surface is covered with the new roll roofing, and the edges have been secured. I'll be working around the vents and chimney tomorrow and that should just about do it. The new roof has much higher albedo than the prior one and already it seems to help with the hot part of the day. When I'm getting addled by the heat, I climb down and do something different for a bit, such as cleaning my room, picking apples, or just hiding in the barn, like just now. Beloved is away for a few days, so hiding in the barn has the dual purpose of cooling off and going on an egg hunt. I never seem to remember to go get the basket when I think to check for eggs, so I go with what I've got: often a skirt or bandanna, gathered like a furoshiki, or a straw hat. 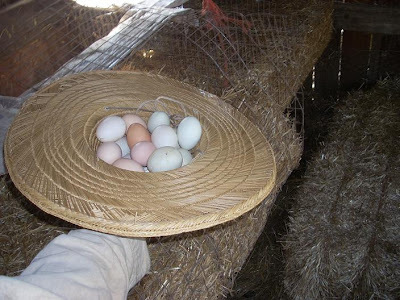 In my hat today there are Araucana and Barred Rock chicken eggs and a few Khaki Campbell duck eggs. I will bring them in and transfer them to the basket in the cool room (combination laundry and pantry, and what here in the Northwest is called a mudroom -- unheated, shady, a good place for the chest freezer and baskets of apples and potatoes and such). 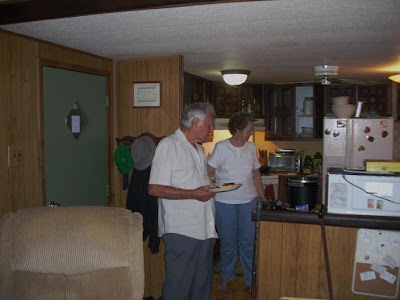 I'm off to Florida in a couple of days to check on my ailing parents: he's 91, she's 80, and they are both legally blind now -- don't ask me how they're staying on in that trailer park by the St. John's River, so far from town. So I will report on our challenge activities up through today and then pack up the computer. Melanie at One Green Generation reminded me that her challenge is not the same as Sharon's -- among other things, I have to plant something new from seed. I didn't have anything really new planned, I thought, but I've just remembered: Apricots! I learned how to crack an apricot pit, fish out the seed, and stratify it in the refrigerator. Hopefully I'll get five new trees out of this, next year. So there! Independence Days: Plant something: I think the most recent stuff is some kale for winter and also leeks. Harvest Something: Come the deluge! Have begun feeding zuke zeppelins and chard to the poultry, who have really run out of grass. They also get anything that bolts, though they don't care so much for the radishes. Umm, tomatoes, peppers, potatoes, apples, blackberries, cucumbers, beans, peas (spring peas still yielding in September! A record!! ), red cabbage, lettuce. Beloved has lifted her Walla Walla onions and they are drying in the big Western Window. And eggs, as always! Preserve Something: applesauce, apple butter, blackberries. Not much else happening as we aren't very available to get it done. I envy Meadowlark's recent achievements in this category! Store Something: I've stocked up ahead on some home maintenance supplies such as insulation, pipe wrap, trim paint, screws, bits, and a hammer tacker. Leftovers from the roofing will go into other projects, and I plan to double the R-value in the crawl spaces this winter. Cooked Something New: Beloved tried a Raspberry Cheesecake which was a hit at our Library Ladies picnic. Worked on Local Food Systems: laid out the rest of the orchard for putting in new fruit trees in the winter, when they're dormant. Reduced Waste: finished converting all the flashlights and the electric lantern to LED, to save on batteries and charging. Learned a Skill: Never used a hammer tacker before. Now I feel like a pro. Never too old to add to one's carpentry tricks, I'm thinking! ... Day Six up on th' roof. We're still doing Independence Days, but sporadically. Beloved is in demand at work, and I'm staycationing to do the roof, which leaves me too stiff and crotchety to pay much attention the ripening bounty in the gardens below. So this is a two-weeks' report, 'K? Plant something: Beloved has put in some kale, cabbages, bok choi, beets, radishes, lettuce. Harvest Something: Tomatoes, green beans, potatoes, cucumbers, zukes, chives, onions, garlic, apples, apples, apples, pears, blackberries, bell peppers, stevia, basil, rosemary, peas (still! Our first ever continuous year of peas! ), celery, eggplant, eggs, bullhead catfish, nasturtiums, kale, cabbages, bok choi, beets, radishes, lettuce. A friend gave us figs. Preserve Something: blackberries, applesauce, green beans. Not enough tomatoes to put up. A poor blackberry year. We'd make apple cider if we had time; anything bruise-y will go to the hens. Store Something: We got in quinoa, amaranth, spelt, rye, oats, wheat berries, and molasses from the co-op. We're also collecting plywood, more deer fencing and eight-foot T-posts for the fencing. Manage Reserves: We're saving the house by tearing off three-tab where the pitch is too shallow and putting on roll roofing instead. 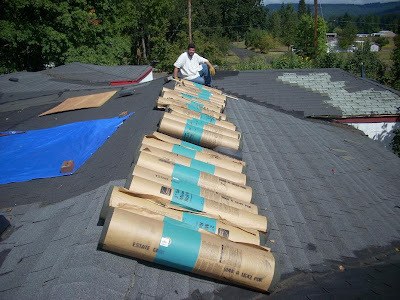 The winds tend to peel off roll roofing, no matter how much you asphalt it or nail it, but we will be adding vertical runs of lath with three-inch screws, as well as a trim of cedar one-by-threes all the way around, also with three-inch screws (Phillips-head, coarse-threaded -- one of the great inventions of all time!). Prepped: Swept many years' accumulation of possum poop off the roof (well, you asked!). Tore down the gutters. Replaced dry-rotted siding and trim. Replaced insulator on 220 volt line to the pumphouse. Painted the trim along the top plate all the way around. Peeled off the old roofing. Built up a low spot with plywood. Cooked Something New: Spelt bread. Pretty good. Worked on Local Food Systems: We got in quinoa, amaranth, spelt, rye, oats, wheat berries, from the co-op. Reduced Waste: Whenever we clear off garden waste we offer it to the poultry. Anything they won't eat we gather up again and offer it to the compost heaps, which are not as finicky. Learned a Skill: how to use 3-mil plastic as an underlayment, by tacking it down with construction glue. Naturally, as soon as we got the old roof off, a storm blew in from nowhere and began pelting the naked sheathing with a hard, cold rain, the first such rain since April. Water poured across the dining-room floor. I ran up the ladder to cover the troublesome and now-unprotected low spot with a blue tarp (joining the legions of blue tarps in our economically strained area). Last Son, who was visiting to help get the roll roofing up from the ground (the ninety pound rolls are proving too heavy for me), followed to help. I was a little concerned about his decision to come up, because I didn't have the long ladder in place, meaning he'd have to use the step ladder to come down, an acquired skill which involved dangling a foot down to find the top step, while hanging onto the corner of the porch roof like a fly. Such methodologies aren't part of his body's vocabulary; he's immensely strong but not agile. I tried to talk him down and guide his feet into place, but he let go the roof before I could place his right foot on the second step. Down he came in what could be described as an "uncontrolled descent." 'K, a fall. This was a serious matter. His foot was now inside the ladder, meaning that he would go over backwards and hit his head on the pavement. He weighs a very solid 245 pounds. I'm his wimpy little mom, at least compared to him. But there were no alternatives. As mothers do everywhere all the time, I stepped underneath him, caught my child in my arms and lowered him gently to the earth. I haven't the faintest idea how I was able to do this. We looked at each other a little wide-eyed, and went into the house to sit by the fire Beloved had wisely made, and shared a microbrew, and that was that. 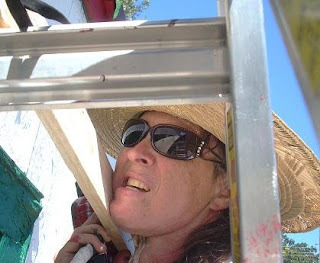 ... of roofing hauled up a ladder by Last Son, whose help is greatly appreciated.